the forgotten baju kurung | escaped. For this year, I've only gotten myself one new decent baju Raya. Like previous years, I don't really believe in spending too much in this department - where you'd probably end up wearing them once a year especially when you rarely wear traditional outfits to the office. Then it hit me. Since I'm married now, our Raya would require us to be in two places - my hometown on the first Raya, and his hometown on the second, or vice versa - at least this is the arrangement we've made so far since being married. My SIL on Shahrul's side has announced that she's sponsoring the scarves for the girls so that we can wear the same one during Raya. We were asked to provide which color we'd like the scarf to be, so typically I chose dusty pink haha. Always a safer choice for me since most baju kurung I own come in somewhat same shade. I was OK wearing my old baju kurung for the second Raya, until it hit me - there's this one baju kurung in soft pink, which I've never worn because it was bought as a bridesmaid dress for one of my closest friends' wedding, only we had to wear a different dress at the end. 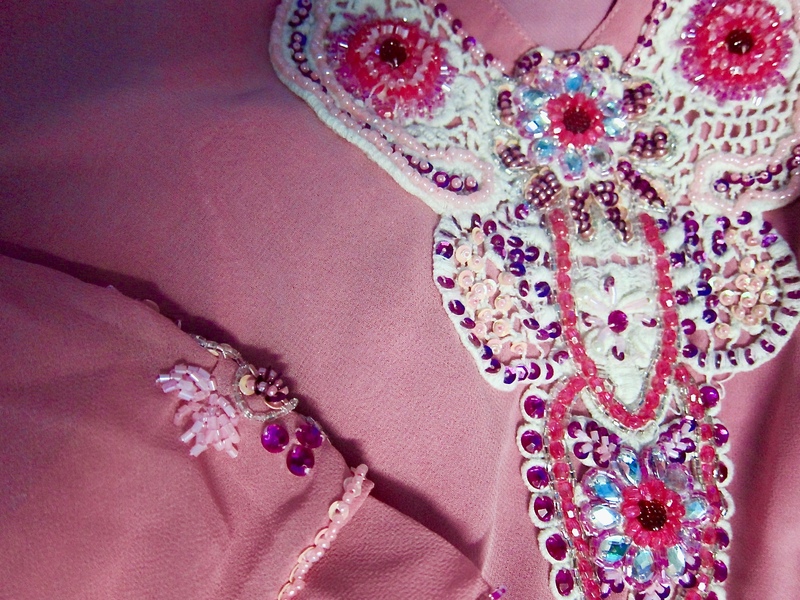 So this particular baju kurung, embedded with rhinestones and embellishments, in all its glory - never made it at the end and has only been kept in my wardrobe. For years. So I rummaged my wardrobe the other day, in the hopes of finding it somewhere since I've never seen it since. And there it was, kept inside a plastic bag (forgotten what for, but I think it was the same bag I bought it with T.T) - and looks so sad. So, so happy I can't wait to wear it!